Gifts from dedicated donors make it possible for riders like Ander to find success at Turning Point. We must raise 60% of the annual budget to keep fees affordable for riders and families who support a child with a disability. DREAMS ARE RIDING ON YOUR SUPPORT! As a 501(C)3 organization, all donations to Turning Point Ranch are both tax-deductible and truly appreciated. Below are a number of the current fundraising programs, but if you are interested in donating materials, horses, or your time, please contact us at give@turningpointriding.org or call 405-269-2225. Our kind and gentle therapy horses need a place to graze and to exercise. Through our Adopt a Pasture program, you can help our “therapists in horseshoes” by providing a donation of $2,100 a year. That donation will cover the management of a TPR pasture from fertilizer to mowing to baling. 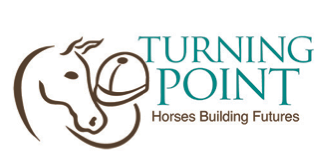 The twelve horses currently serving at Turning Point are key partners in the results our clients achieve. Each horse is carefully chosen for temperment, gait and intelligence. They come in all breeds, sizes and colors but they share a heart for the lives they change and the bonds they build with people facing challenges. It’s not an easy job and for most of our herd, it’s a second or third career. Each horse is fed a specific diet by volunteers who love horses and watch ours carefully for health issues. By adopting a stall, you are supporting the place we feed and care for one of these amazing horses for one year. Turning Point serves Middle School, Junior High and High School special education students through a contract with the Stillwater Public Schools. Private clients who are older, younger or homeschooled pay tuition of $25 per session for a 12 week semester. Funding a scholarship, offsets the cost of therapy for one rider for one semester or lowers the cost of riding for a child for an entire year. There needs large and small that could make a real difference in the day to day operations at Turning Point. Perhaps you have an item you could donate or a group of friends that could contribute to a purchase or dollars that can offset a cost. Atwoods, Tractor Supply, Stillwater Milling gift cards for tack, supplies $50 per mo.